RESTORING OLIVIA: Freedom - what's your definition of it? Freedom - what's your definition of it? Happy Independence Day 2017! Freedom.........isn't that what we all want? What does freedom mean to you? The definition means different things to different people. Olivia needs a special kind of freedom, as do I. I think we both are looking for freedom from her chronic illness, from scary seizures, from suffering. Freedom from the hammering disappointment of lost dreams...freedom from dependence on drugs that never work.......freedom from whatever binds us. It's her new gait trainer and it was finally delivered last Friday. 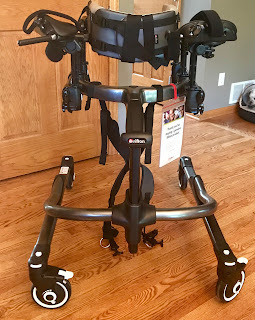 It's kind of like a baby walker for an adult. Olivia lost her balance and ability to walk several years ago. She is slowly getting better and really needs the freedom to walk without support and build her weak muscles back up. Broken ankle. Forced R&R. Feet up - time to write, but I couldn't. I was crabby. I was negative. Who wants to read that? Fighting for her freedom. Remember.....someone fought hard for the freedom we take for granted. I will do my damnedest to fight for hers. Why do I do it? For those who don't understand please consider this quote by Theodore Roosevelt. I dare greatly for my girl.